I've been in patchwork heaven, stitching up seasonal cushion covers. This week's finishes, include companions for my Sparkle Snowflake cushion. The pattern (minus the applique snowman...which is my design), to make these patchwork beauties is from my talented friend, Amanda Jean. She's just opened an online shop which is offering this pattern in pdf format for sale. I thought adding applique to the center of the cushion would add a little extra something special and I had fun adding dimensional detail to the snowman. His eyes are round beads, his mouth is embroidered, his scarf fringe is wool and his button front comes from my vintage stash. I followed Amanda Jean's pattern for constructing the patchwork pillow front, but I did make a couple of small changes in finishing. My binding is narrower than the recommended binding in the pattern and I also put zippers in the back of the covers, instead of the envelope closure. These changes were just personal preferences for finishing - you really can't go wrong following her pattern to a "t". She even gives you suggestions for quilting your pillow. 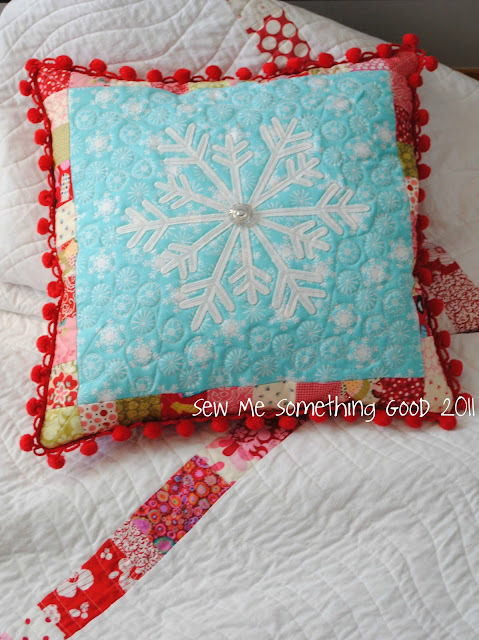 I chose to duplicate the free motion quilting I used in my snowflake pillow. I'm certain that a mini blog break is on the near horizon. Time will be spent with family and enjoying treats of the season. I want to wish you all a very happy holiday season. May it be filled with joy, love and peace. I'll be back here as soon as I can. Take care! and free motion quilted in metallic silver on the blue background with some sequins and beads added ( because we're after the look of the sparkle of falling snow in this design ;o). Those swirling and whirling quilting stitches were a lot of fun to sew! I used some of the same fabrics in this patchwork as I had in my own sparkle snowflake cushion, but I also tried adding in some yellow and yellow-greens to customize this for Brenda. Look at the fun print I found to make the cushion back! It had all the colours I was looking for and it helped guide my fabric choices for the cushion front. The linear print even hides the fact that there's a zipper! Thanks, Brenda, for giving me the opportunity to create something one-of-a-kind for you (and for being the easiest customer to work with... evah! ;o). I hope it will add some "sparkle" in your home for many years to come. I recently stitched up 3 of these little pouches in under 30 minutes and to make things even easier, I used fabric from a layer cake (10" pre-cuts). I followed my tutorial (click here) to make these quick gifts. The bright fabrics and ribbon for drawstrings, make these as pretty as they are easy to sew. With the ribbon tied in a bow and the pouch empty, it looks like a flower. It's the perfect size to store little treats in and a great little organizer that can be tucked into a larger bag. One tip for making these pouches look their best? Choose fabrics with lots of contrast. I do think filling this little pouch with some chocolates would make a lovely gift. Or you could tuck in bar of special soap with other bath treats. These pouches make for a lovely presentation. Just like spools of pretty thread, in my opinion, you can't have too many of these pouches on hand. They're my number one, quick-to-sew gift idea! When it's good, why stop? You know I'm talking about sewing, right? :o) Being very pleased with the colours combined to make my Sparkly Snowflake cushion, I couldn't resist some more patchwork using those same fabrics. I didn't stop there. Inspired by a good snowfall over the weekend, I thought adding a couple of snowmen seemed fitting. So, I've been doing some more machine applique work. So far, I've managed to stitch up two happy, matching, mirror image fellows. Now to find them some button eyes and trimmings! I'm rather giddy over the cushion I just finished to add some seasonal sparkle to our living room. I can't begin to tell you how it makes me happy to see my design work out even better than I had originally envisioned. The blue snowflake fabric was the inspiration behind making a large applique snowflake. and the next thing I know, I'm outlining the snowflake with that sparkly thread! 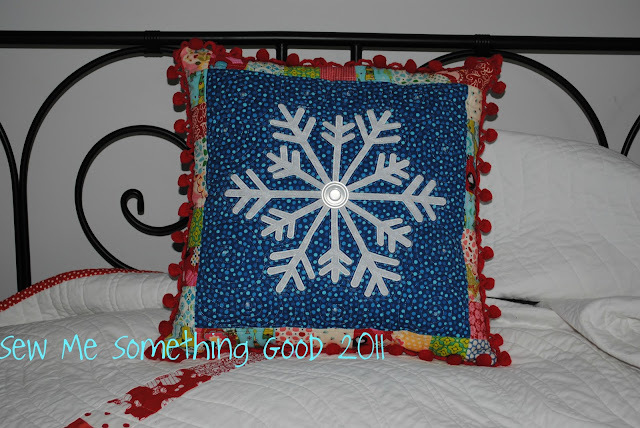 Pleased with the results, but wanting more sparkle I also FMQ inside the design of the snowflake. Then I came across a treasured glass button I have from my great- grandma. It seemed the perfect finish to the center of the snowflake as it adds more sparkle! The blue, white and touch of silver looked lovely and I was all set to quilt my cushion top and proceed to finish the cushion, but the lovely colours in this jelly roll gave me another idea. My plan for finishing the cushion changed! I decided to add some patchwork along the four edges of the front, incorporating some of the fabrics from the Sophie line. Ready to quilt, I couldn't decide on a design. I thought of stitching swirls or echo quilting the snowflake but neither choice really seemed to be quite right. I kept staring at the cushion top... until it dawned on me that simply quilting circles around the snowflakes printed on the fabric would convey the look of falling snow - which I think suits it perfectly! As much as I love the front, I adore the backing. What goes better with pretty snowflakes than bright coloured mittens? A hidden zipper runs through the center back, making it easy to remove, while the busy print echoes the bright colours of the patchwork bordering the snowflake on the front. LOVE it. The final fun touch, is the red pom-pom fringe! Meantime, I'm going to enjoy the sparkly snowflake that will never melt. Wishing you a happy weekend and some sparkle to your day! to make the scrappy bento box quilt, meant some stash shopping for the backing. Originally, I thought I would use this plaid fabric I scored at the Unused Fabric and Crafts Sale to sew a shirt for my son. The fact that I had paid $2 for 92" of it and that it was red, changed my mind. A quilt back it is. Sorry, son. Quilt making comes first. Shirtmaking.... well, let's just say it's not at the top of my sewing list right now. I think it works. In a crazy-one-of-a-kind sort of way. Just the sort of thing I like, because along with taking pleasure in creating, I do love using what I have on hand and being pleasantly surprised with the unique results. Something snow themed is on the cutting table, just waiting for me to get other projects completed first. Obviously, fabric is one of my "favourite things". What's yours? is placing a small design board to keep my block layouts clear and understandable for piecing, right in front of me while I sew. Belle has been humming along in the evenings piecing Scrappy Bento Box Blocks in my effort to make a quilt from this charming block. Just to prove that my mad method for block piecing actually works, check out my progress. From another view, here's the line-up (not arranged in their final layout, just yet). I think with a bit more piecing, I'll have a quilt top! I want this to be a quilt for our living room to coordinate with the scrappy red pillows I made a little while back. That should make the room merry and bright (while putting a dent in the stash of reds I seem to have accumulated... ha! we know that won't happen. Not unless I stop adding red fabrics to the stash. Shhh... please don't tell the man of the house that it's a losing battle. lol). Back on track, with things to share with you, here's a peek at my crochet project progress. The next step will be blocking and then I will be able to join all my motifs together. Fingers crossed that I will finish it all by the end of the week! this charming little heart is meant to be a pincushion, but I like it too much to stick it with pins. I'm going to add a ribbon to it so I can hang it in my sewing room. ... then there's this prettily embroidered button bag... totally gorgeous work, Wendy!! and no sewing set would be complete without a needle case, just look at the pages of this beauty! Keeping it all organized and looking fabulous while doing it, is a yummy fabric tray. Oh, my! Wendy knows me well, doesn't she? 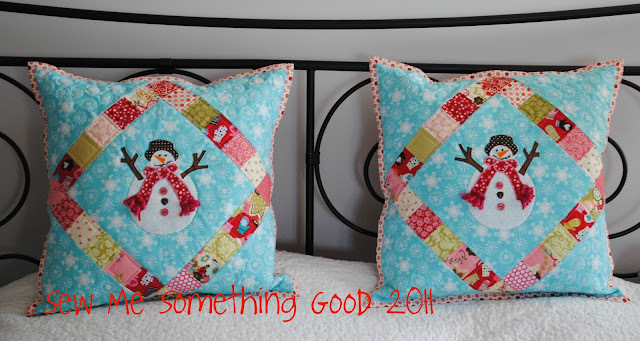 I'm crazy about red and aqua blue together and her gifts will be happily at home in my sewing room. I smile every time I look at her thoughtful gifts. Did I mention that Wendy is talented, not only with her sewing but many other needle arts plus, she crafts beautiful cards. Yes, my friend spoiled me ( and I'll never complain over that ;o). Thank you ever so much, Wendy. I'm tickled with pleasure over your beautiful gifts - you definitely added some extra special Bliss to my day month. I had fun making these gifts to cheer Wendy (if you're curious to see what else I tucked into her parcel, go here to see). What a joy it is to make friends with someone as lovely and generous as Wendy, and better yet to get to swap a little handmade love to brighten one another's day!